We hope you all had a fantastic Christmas and enjoyed yourselves whatever you were doing. 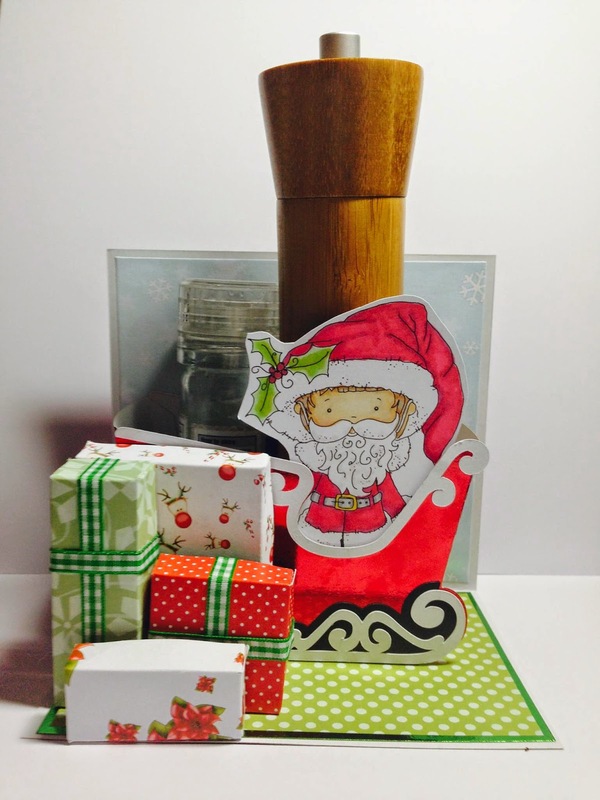 Just a quick post this week to announce the top 3 and winner from week 49 Christmas table or Christmas décor. It was a very quiet week, we assume you were all busy getting yourselves ready for Christmas! 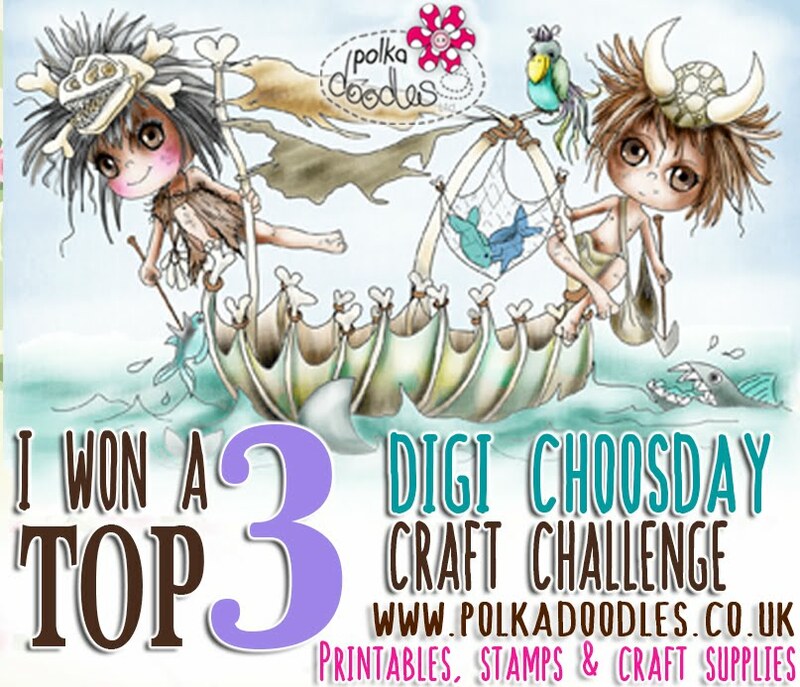 please email us at sales@polkadoodles.co.uk quoting DCwk52001wk491 to claim your prize of a free digi. The design team are still on holiday this week so come back next week to see some fabulous makes from them. IT'S DIGI CHOOSDAY CHALLENGE DAY!!!! Hi there everyone, well it is the last blog of the year here at Digi Choosday, yes, Nikky has given the Design Team a lovely Christmas break because she is super awesome sauce! We will be back on 6th January, so try not to miss us too much!!!! To enter the challenge you can make anything you like, from a card to a home décor item and anything in between. You DO NOT have to use our products to enter. You have until 30th December to enter and the winner will be announced on 6th January, so lots of time to get your entry in. All we ask is that you follow the theme and the simple rules that can be found in the side bar. The winner will receive a free digi image from the (Digi Store). The winner from Week 47 - Xmas Celebrations can be found at the bottom of the post. So for the last time in 2014 let's see what our Design Team have made us for this weeks challenge! 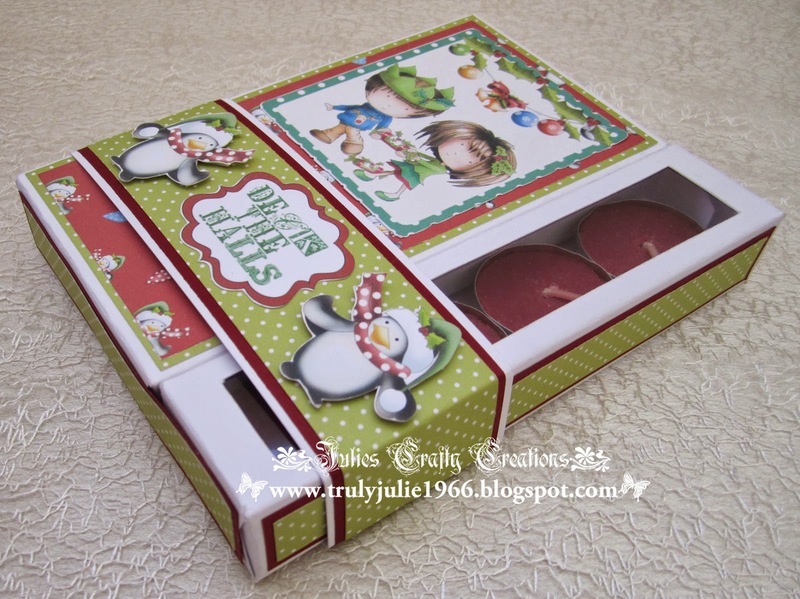 Caz..For my last minute project, I have made small explosion box..I have used the gorgeous image called Presents. She is available as a digi from here. She is also available, along with all the papers i have used on the Work & Play 5, Festive Hollybobs, Download and also on CD. 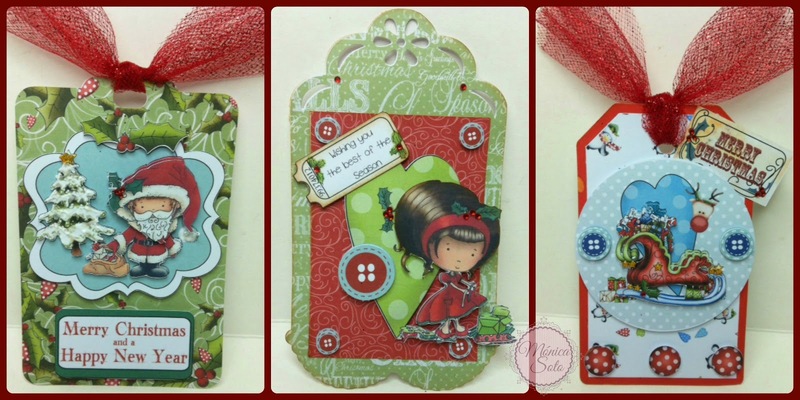 Monica- For my "Laste Minute Christmas" I made a set of three tags, using design sheets 01, 03 and 06 from "Work & Play 5.-Festive Hollybobs Collection". The paper base of each tag and the sentiments are also part of the same collection. In all the tags I worked with decoupage technique because the design sheets have all the elements to work in this lovely 3D technique. 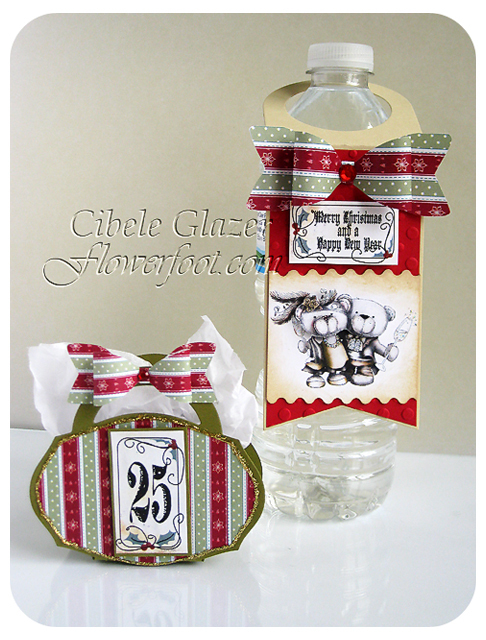 Cibele - For my project I made a bottle tag and a little gift bag using paper, sentiments and the bow from the Festive Hollybobs Collection and the pre-colored Winston Bear Celebrate from the Winston Deluxe Full Collection. The Winston Bear image is also available uncolored separately HERE. Nikki - Christmas is literally around the corner and I still have so much to do.... I always find time to be creative though. For our Last Minute Christmas themed challenge, I chose to use the adorable image called "Cards". I thought this image was so cute and could not wait to ink her up. 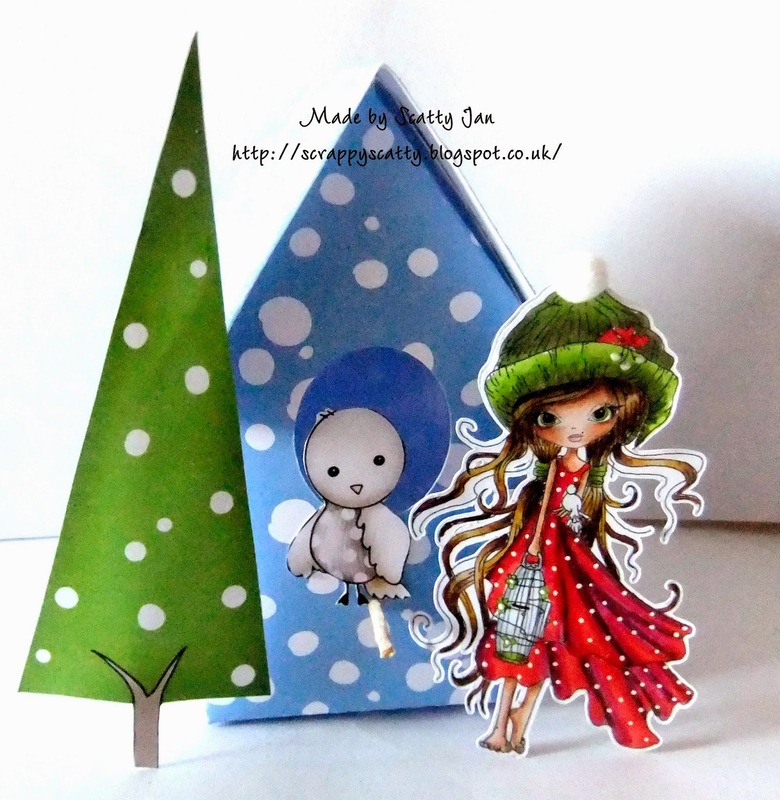 She is available in the Festive Hollybobs Work and Play 5 pack. Either in the CD option or the Instant Download option or you can buy her as a single download. 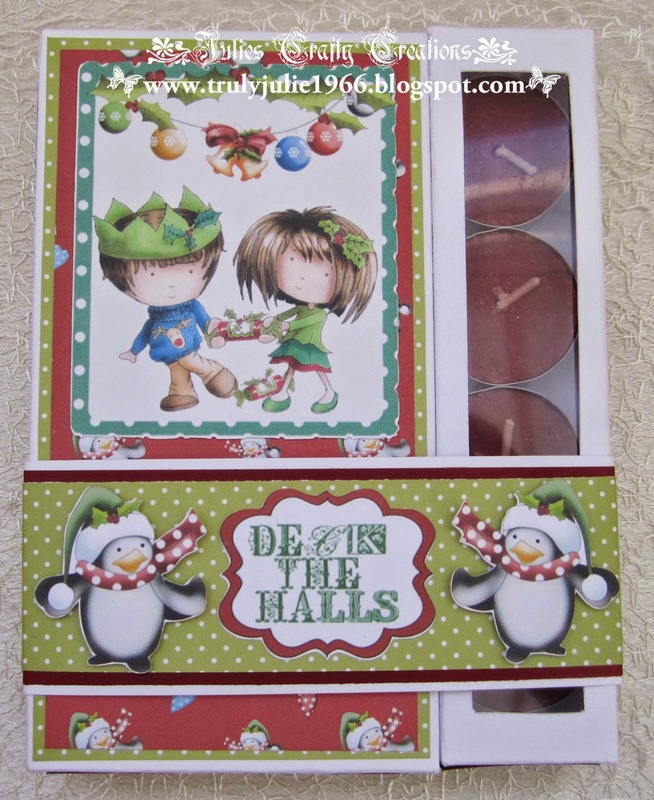 The paper I used is from the Christmas Joy download pack. I made this card as a blank card so I did not use a sentiment. I inked it up with my Copic markers. This is also not my typical 5.5" square card. I opted to do the A2 card. 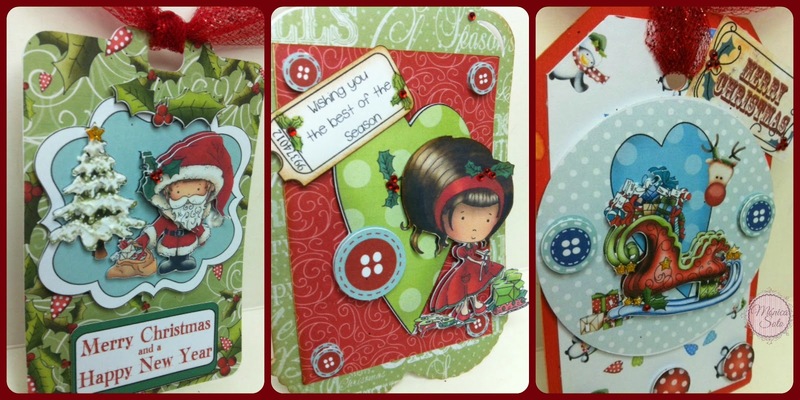 Tanya - So this week’s challenge is ‘Last Minute Christmas’ and I’ve made some cards to match the gift tags I made a couple of weeks ago. 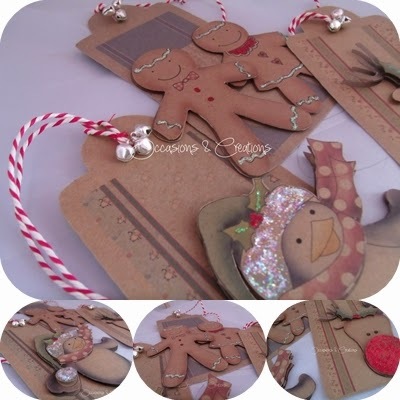 I’ve used kraft card and one of the papers and the images of Rudolph, Gingerbread people and the Penguin from the embellishment section of the Festive Hollybobs Work & Play 5 download (which you can get HERE or as a HERE which I've decoupaged and added glitter and red/white twine and little jingle bells. Merry Christmas everybody!! 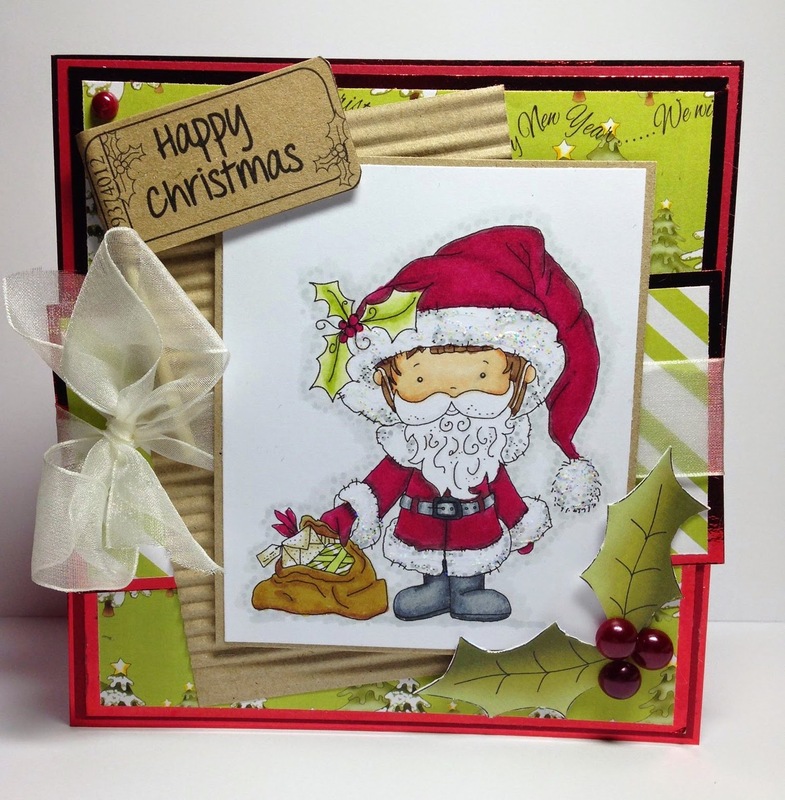 Emma - For my 'last minute Christmas' project i have put together a quick frame card using Festive Hollybobs Elf & Santa who can be found as single digi's Here & Here. I have coloured them up with Copic's & Pro Markers, I have added a bow, wooden bell & some poinsettias for that added Christmassy touch. Lynda- Happy Christmas ;-) Not many more sleeps!! 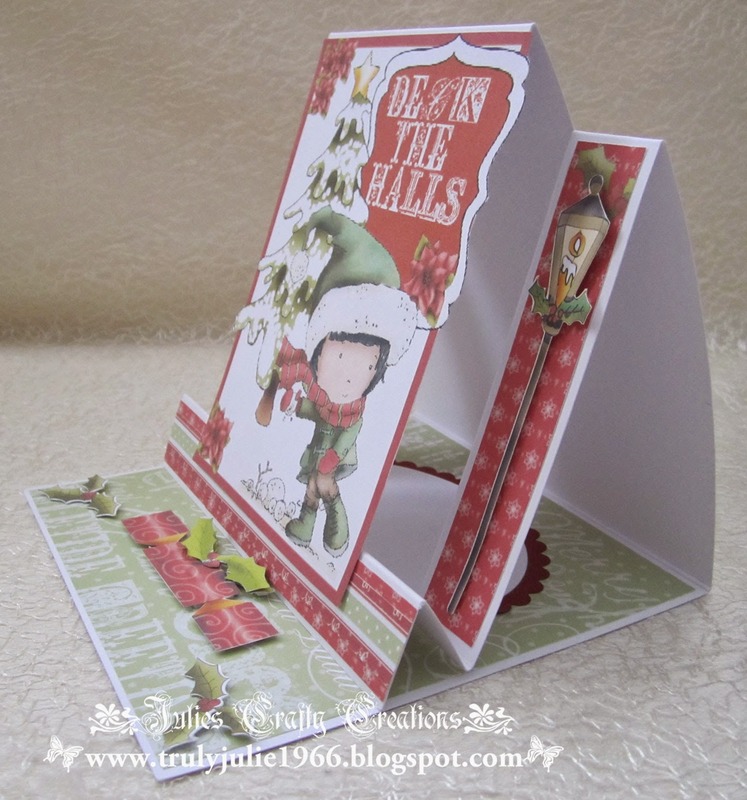 I decided to make a Christmas Card this week using the Work & Play 5 FESTIVE HOLLYBOBS collection, this collection is available on cd here or as an instant download here. 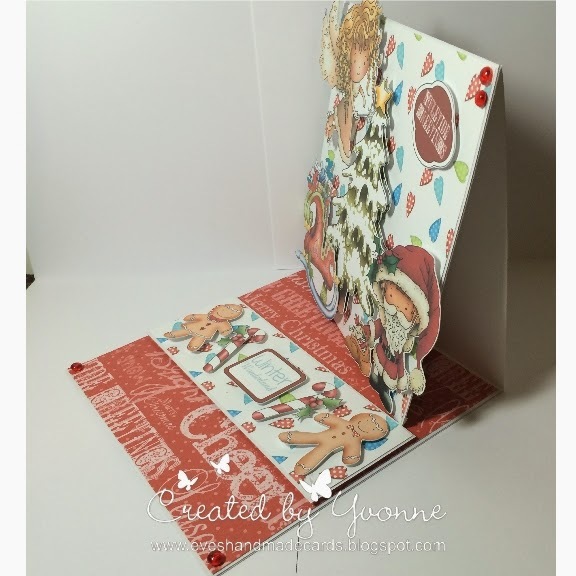 I used the sentiment ticket, papers and digi stamp from this collection. Wendy - With this weeks theme being last minute Christmas, I thought I'd do just that, make my card at the very last minute. It WAS out of choice! I chose to use one of Nikky's design sheets from Festive Holibobs. I love these design sheets, they are great for either a quick card or if you're not that confident yet with layouts. What a great selection of inspiration, don't you agree! 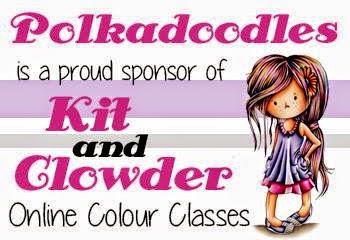 please email us at sales@polkadoodles.co.uk quoting DCwk50001wk47 to claim your prize! IT'S TIME FOR DIGI CHOOSDAY!!!! You have until 23rd December to enter and the winner will be announced on 30th December, so lots of time to get your entry in. All we ask is that you follow the theme and the simple rules that can be found in the side bar. The winner from Week 46 - Presents & Gifts can be found at the bottom of the post. So enough with the talking, let's see what our super talented Design Team have made us for this weeks challenge! Yvonne - Hello there! 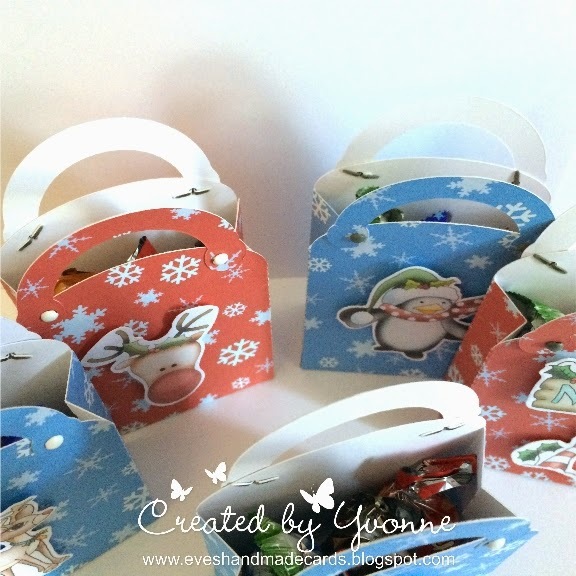 Well I decided to make little gift bags that you can fill with treats for my 'Xmas table/decorations' project. These were so fun to make and I have them filed away (and filled) for the big day itself. 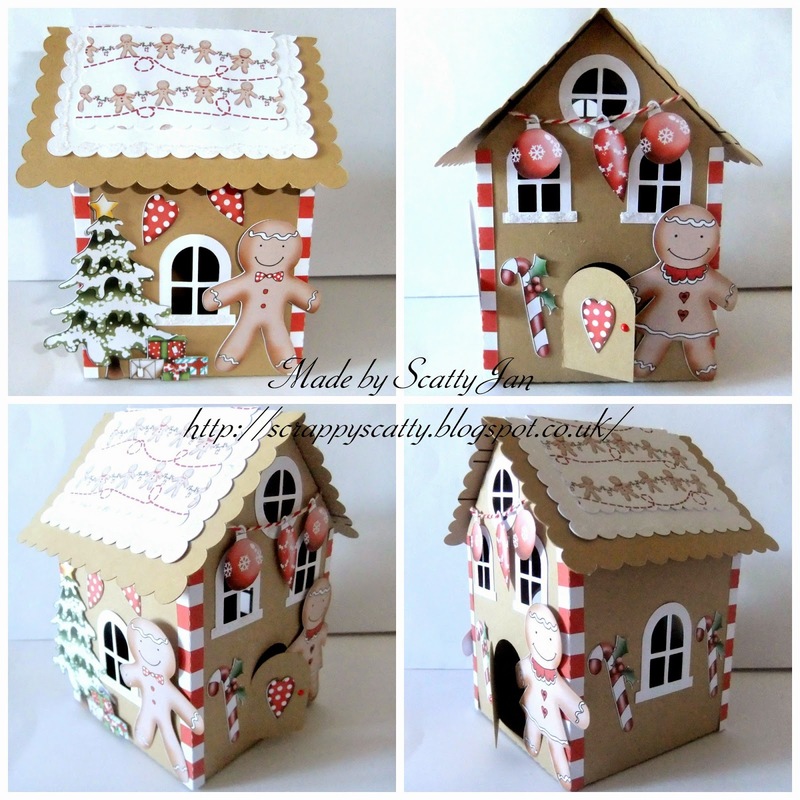 A nice little party favour I thought, for when you all sit down at the table before the starters come.... Of course the best collection to use has to be the Fantabulous - Work & Play Festive Hollibobs Collection, which you can purchase as an instant download or get it as a CD-Rom. 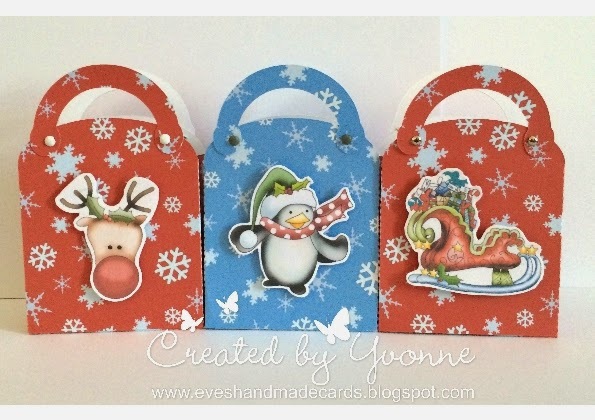 I used one of the beautiful papers and some of the embellishments, cut the template for the gift bag out on my silhouette and quick assembly. Perfectly simple and effective. Crafting Vicky Unlike Scatty Jan... I have a really really hard time making anything that has to do with Decor... So when I saw this challenge I started to sweat... and dread it... but I figured out what to make. My dad loves owls and I figured the great one from the Christmas Joy bundle set would make a fabulous little decoration. So I printed it twice (reversing one of the image and created this little jar with it. It's my own little version of a snow globe. Caz Ok thought now what can i make as part of table decor..Decided to decorate a candle, I have used the gorgeous image called Angel available as a digi here. 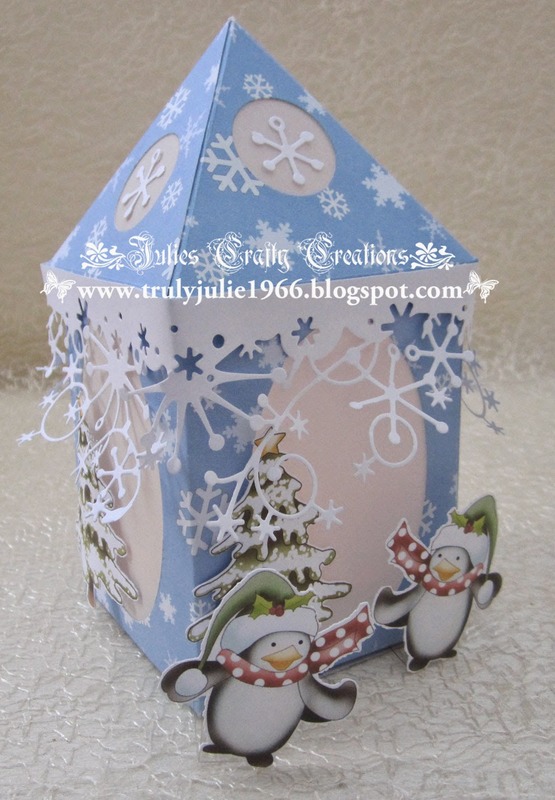 Also added few snowflakes you can find these on Festive Hollybobs as a download. or on CD you can also find Angel on them too. :)..I quickly made a holly wreath using scrap card to place round candle..
Tanya - So this week’s challenge is ‘Xmas Table/Decor’ and I’ve decided to pull out all the stops and have made a gigantic crafty project this week, something that I’ve been able to get my crafty teeth into. I've used paper and Hollybobs Santa from the Festive Hollybobs Work & Play 5 downloads which you can get HERE together with the letters from Magical Winter CD available HERE to make a decoupaged ‘Please Stop Here’ canvas wall hanging. You can read all about my make and see more close up photos by going to my blog. Monica.- I love Christmas gatherings around the table. A warm cup of tea or coffee and good company is priceless. I made a table set using different techniques: A table lamp decor, using the lovely Hollybobs Choir digistamp, that is also part of the Work and Play5.-Festive Hollybobs Collection. Also, I used "flourish" and "celebration" svg´s that are part of the Winston Deluxe Full Collection, I cut it on golden vynil and apply it to a red plate and cup. God bless your tables!!! Kate - I decided to make some place setting for our Christmas dinner table. I used some of the fabulous Christmas Hollibobs characters and tried to match them with my family. You can find all the details on my blog. Nikki - I don't really make much besides cards. 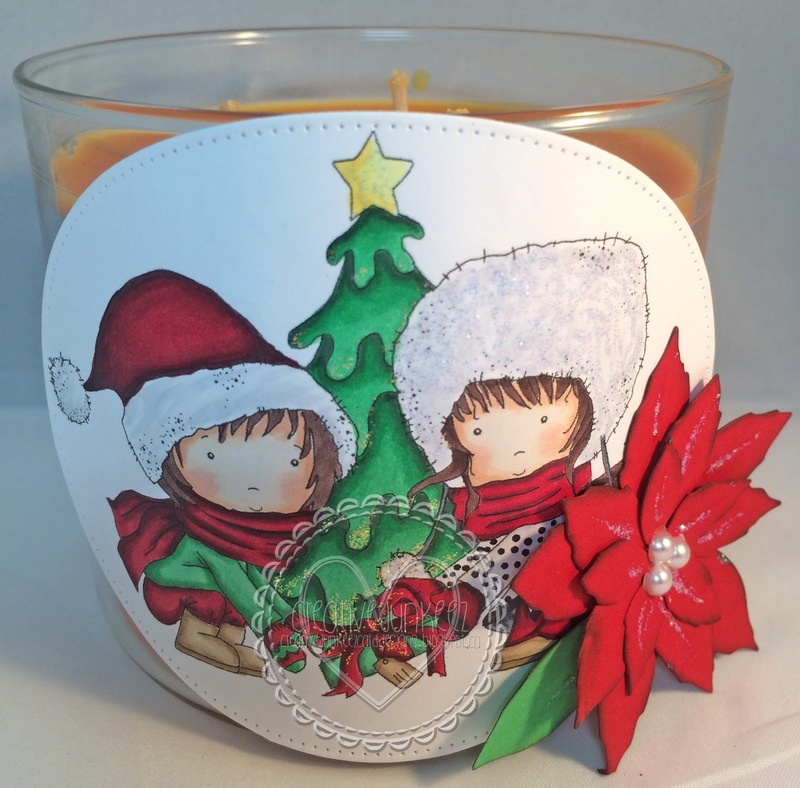 I can't seem to create anything that is remotely 3D, but after I saw the creations that my fellow DT have created, I had to act quickly...... so I decided to add an image to a candle...... My inspiration for the table/XMAS decorations theme I am using an image called "Tree". You can find this digital in a variety of ways, either as a single download. You can also purchase it as a whole set called Work and Play 5 Festive Hollybobs in CD or Instant Download. I inked the image with my Copic markers. 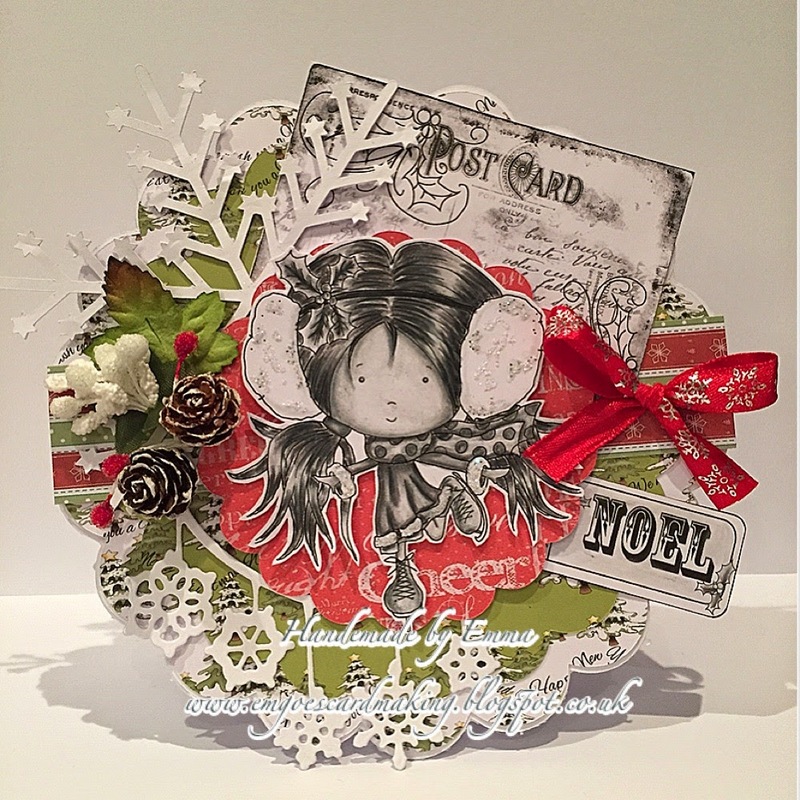 Cibele -I took this challenge as an opportunity to make my yearly ornament for my daughter using this adorable little guy from the the Festive Hollybobs Collection. You can also get him separately HERE. I printed him and colored him with my copics. I used a Display Globe and added some chunky glitter along the edges and up along the sides to make it look frosted and wintry. 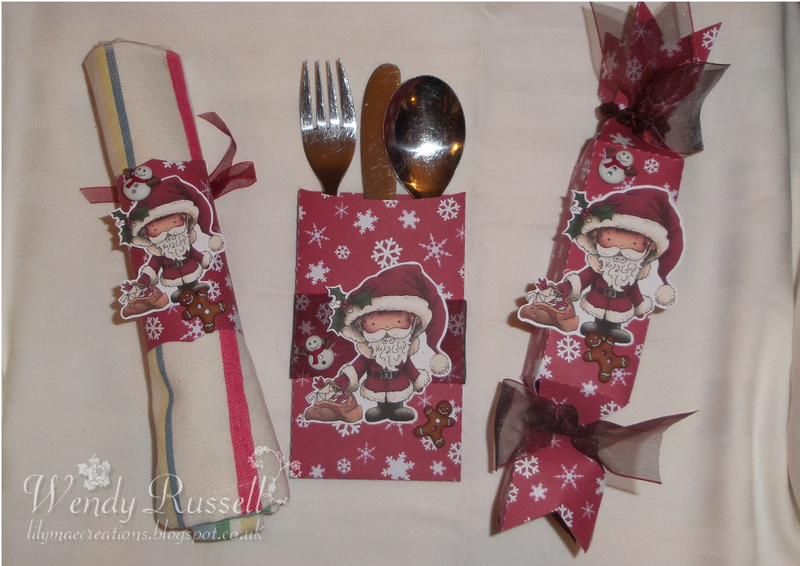 Wendy - For this weeks table decor challenge, I have done a full place setting, including Cracker, Cutlery Holder & Napkin ring. I've used a paper from the Festive Hollybobs Collection and printed this on both sides of card for a consistent look. The image of Santa is again from this collection, but also available individually as a digi stamp here,as well as a polymer stamp to order here. please email us at sales@polkadoodles.co.uk quoting DCwk49001wk46 to claim your prize! 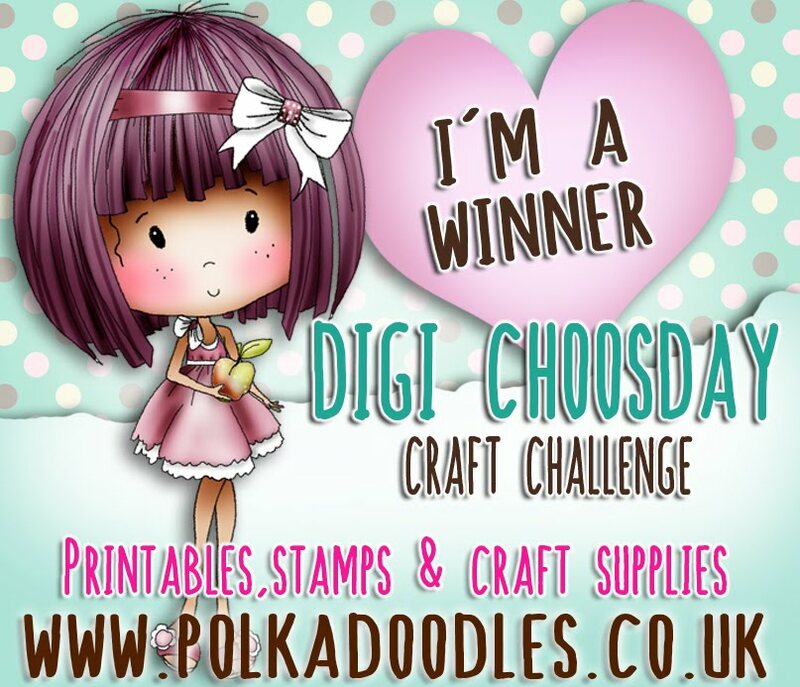 Don't forget - there is also a great challenge going on over on the Polkadoodles blog so make sure you check it out and get your entries in there too for a double chance of winning!! WELCOME TO ANOTHER DIGI CHOOSDAY!!!! You have until 16th December to enter and the winner will be announced on 23rd December, so lots of time to get your entry in. All we ask is that you follow the theme and the simple rules that can be found in the side bar. The winner from Week 45 - CAS can be found at the bottom of the post. So without further ado see what the fabulous team have made us for this weeks challenge! 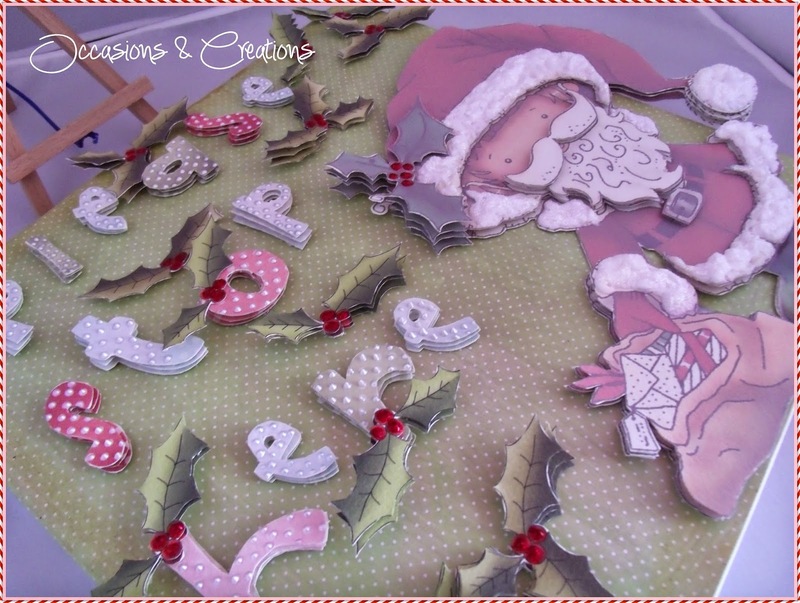 Crafting Vicky - I really do love Christmas!!! 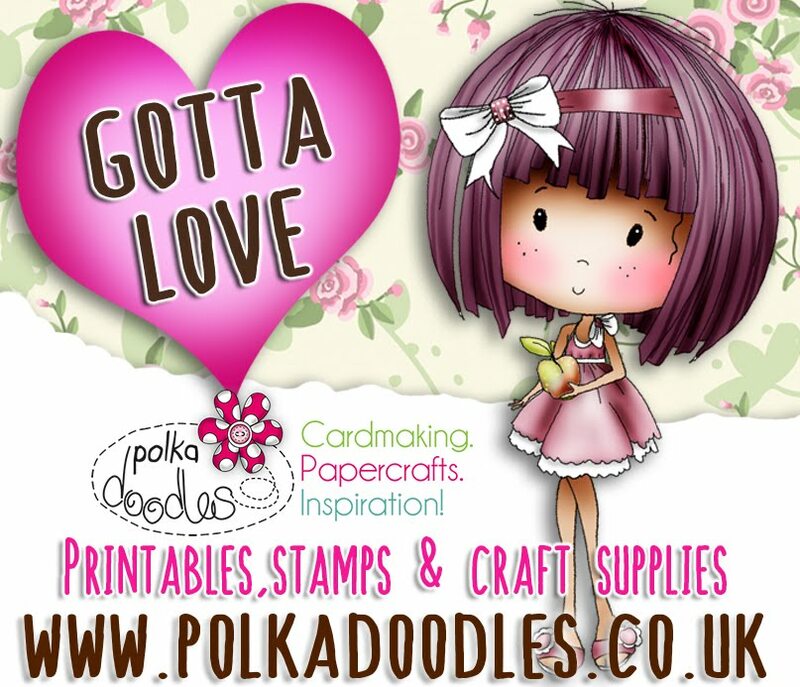 It's my favorite Holiday of the year so creating for it is never HARD especially when there's some fabulous Papers, images and embellishments on the great Festive Hollybob's collection that you can purchase here Download or on CD. 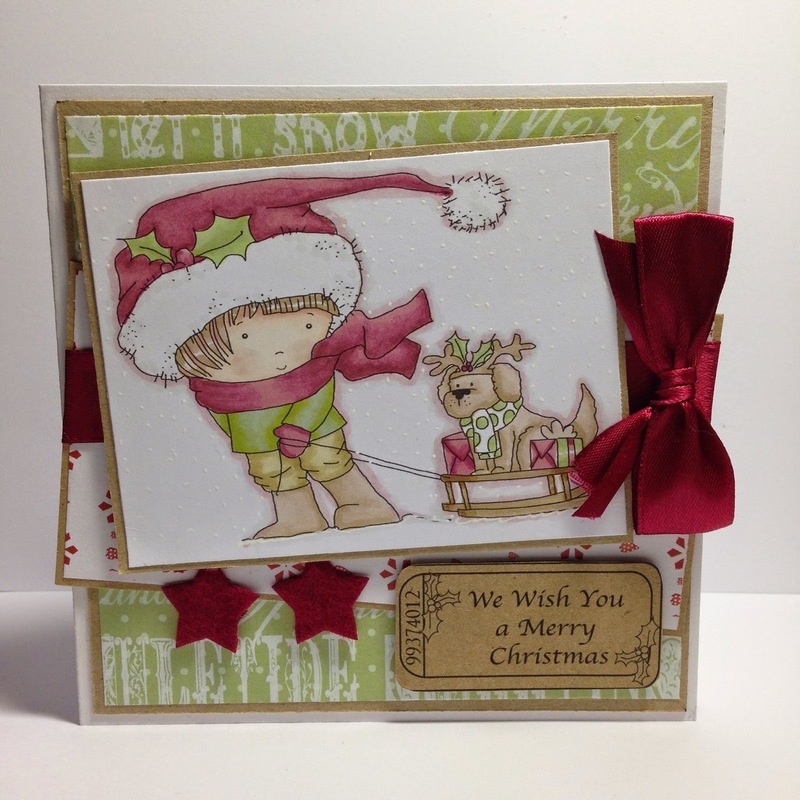 For this card I used the awesome image called Mistletoe! He's just ADORABLE and I went with a different color mix than the traditional. Love the green with the blue. Scatty Jan Okay thought I would use Octavia for a change , haha who am I kidding - I totes adore and cant colour her enough. This one is Octavia Bird in the hand and i have coloured using Graph'It Markers. 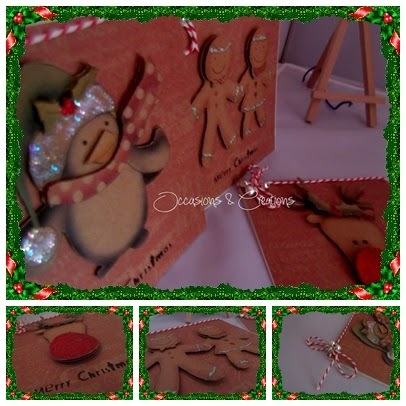 The papers used are from Festive Hollybobs CD and the sweet little birdie is from the Winston collection. Monica - I´m a Christmas fan. I love to make Christmas projects and I also love 3D. So, for this challenge I chose to work on a shadow box. All the papers I used are from Work and Play 5 Collection.-Festive Hollybobs, their high graphic quality is ideal to work with the "drag and drop" feature of the Silhouette Cameo. The ticket shaped sentiment and the bow are also from the same collection, as well as the lovely digis "HollybobsCards" and "Hollybobs Tree Fun", but if you want just the digis you can find them here and here. Caz I thought it would make a change to make a shaped christmas card. 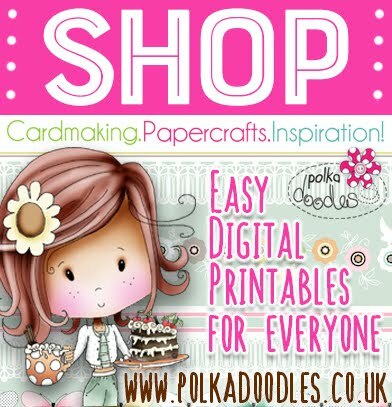 I have used the lovely image called Postbox, available as a digi here. Can also be found along with the papers, snowflakes and sentiment, in the Festive Hollybob's Download or on CD. 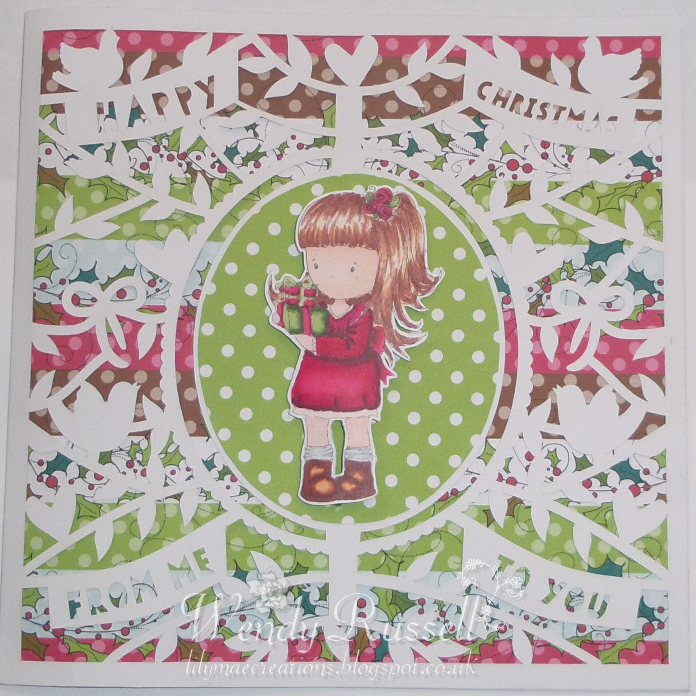 Cibele - For my project, I used this cute little image from the Festive Hollybob Collection called Christmas Card. She's also available as a stand alone digi. I also used digital papers along with one of the ticket sentiments from the same collection. I had a lot of fun coloring her with my Copic markers. Tanya - So this week’s challenge is ‘Xmas’ and I’ve decided to get ahead with my present wrapping and have made some festive gift tags using the pre-coloured images of the penguin, Rudolph and gingerbread people and the card insert papers from the absolutely wonderful Festive Hollybobs Work & Play 5 download available HERE Festive Hollybobs is also available as a CD HERE. 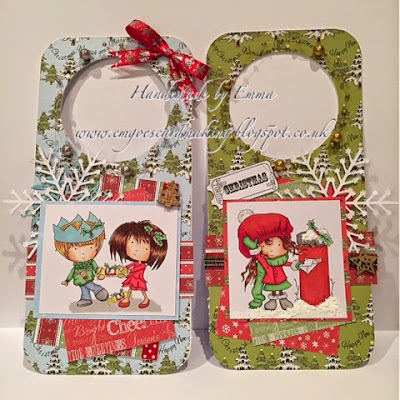 I’ve used my digital designer to bring the images and papers into and make into tags on Kraft card. I’ve printed the image several times and decoupaged them and added glitter and red and white twine and a festive jingle bell (or three). You can get all the details of my make from my blog. Emma - For this weeks Xmas challenge card I have used the super cute Skater digi that can be found Here, I have coloured her up with Prismacolor pencils & this is the first black & white image i have done. 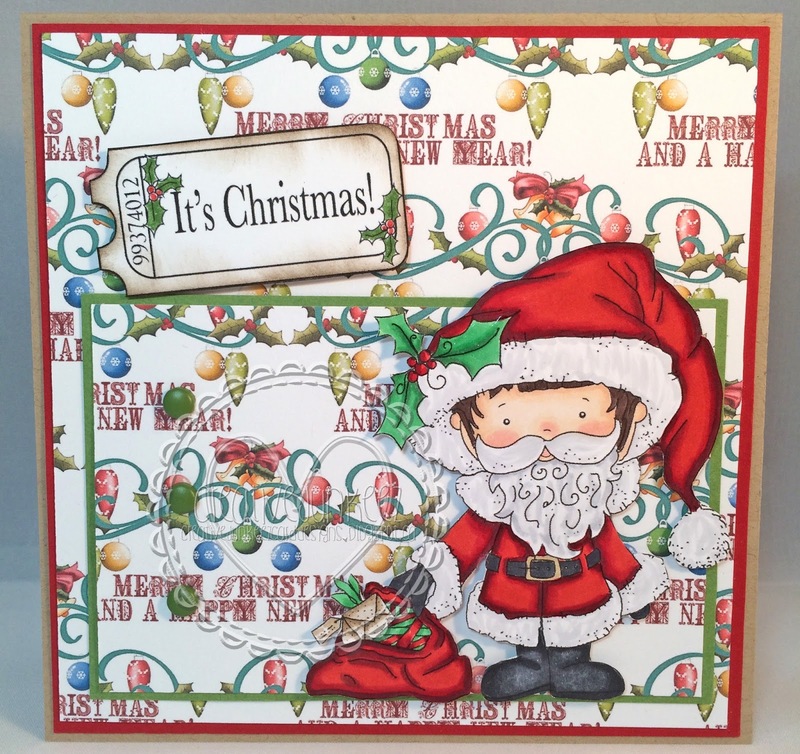 The papers & sentiments are all from the Full Hollybobs festive collection Here & this is where the sweet little Skater digi can also me found. 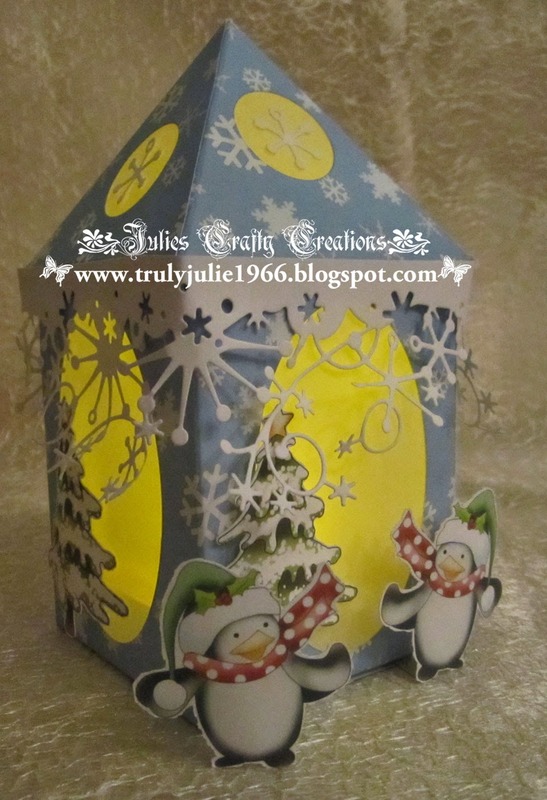 Wendy - This time I've chosen an image which isn't actually from a christmas kit. Maddie with Presents, is available as a single digi but she's also available as part of the Pretty Sweet Mini CD Collection. I've used papers from the Christmas Joy Bundle. 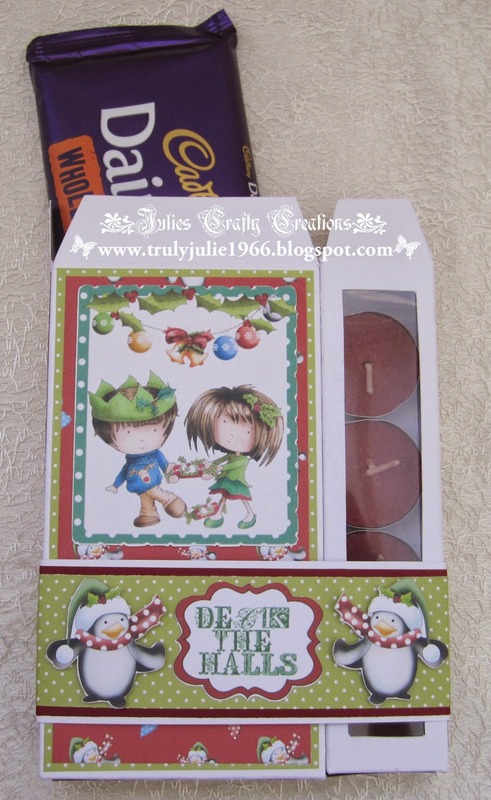 Julie - I have made a cute little gift box that contains a bar of yummy chocolate and 4 mulled wine scented tea lights from a sheet of A3 card. The gorgeous papers, sentiment and images are all from the wonderful Festive Hollybobs Download collection, which is also available as a CD for those of you who are happy to wait for a physical CD to arrive in the post...The fab image at the top of my box is from one of the brilliant design sheets from the download, the penguins (I flipped and same image horizontally for the 2nd penguin) are from the embellishments section and the sentiment is one of many available in this collection, there are also loads of fabulous tickets in there too so check it out! Kate - Now there should be no reason for anyone not to enter this challenge as you must all be deep in Christmas makes or already have them all done. 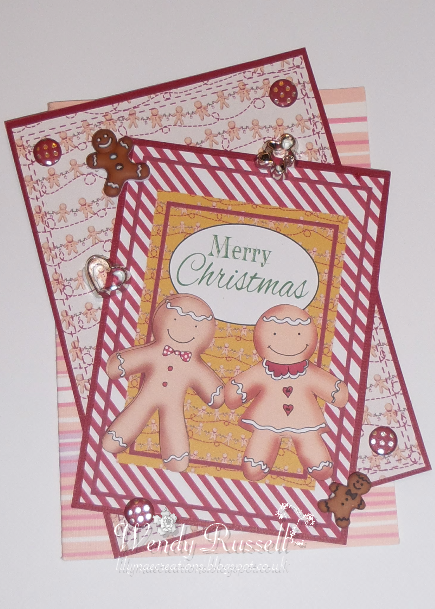 I decided to use the gorgeous Xmas Angelberry Hugs for my make this week and decided to make a very girly card. You can see all the details on my blog. What a FAB assortment of work from the team this week, don't you agree! please email us at sales@polkadoodles.co.uk quoting DCwk48001wk45 to claim your prize!